Background: Phyllanthus niruri, in Indonesia, is known as “Meniran” has a long history of use in ethnic or traditional medicine worldwide, mainly as an antihypertensive agent. Objective: The present study was designed to isolate and identify active compounds with angiotensin-converting enzyme (ACE) inhibition activity from P. niruri herb and confirm the mechanism of action, affinity, and domain specificity interactions of the isolated compounds. Materials and Methods: Some fractions of P. niruri methanolic extract were subjected to column chromatography and preparative thin-layer chromatography to get active compounds. Structural elucidation was determined via spectroscopic methods. ACE inhibition activity was measured using hippuryl-L-histidyl-L-leucine as a substrate in vitro assay. Furthermore, confirmation of the mechanism of action, affinity, and domain specificity interaction of the isolated compounds on ACE complex macromolecule (protein database id: 1O86) was performed by in silico molecular docking studies. Results: In this work, four active compounds were isolated from aerial part of P. niruri, including hypophyllantin (50% inhibition concentration [IC50] = 0.180 μg/mL), phyllantin (IC50 = 0.140 μg/mL), methyl gallate (IC50 = 0.015 μg/mL), and quercetin 3-O-β-D-glucopyranosyl-(1'''-6'')-α-rhamnoside (IC50 = 0.086 μg/mL). In silico molecular docking method emphasizes ligand-residue interactions, thereby predicting the inhibitory activity of these compounds. After docking to an ACE complex macromolecule, quercetin 3-O-β-D-glucopyranosyl-(1'''-6'')-α-rhamnoside obtained more interactions than lisinopril. Conclusion: The results were obtained from in silico and in vitro experiments and confirm the potential active compound is an ACE inhibitor and a new antihypertensive agent. Abbreviations Used: P. niruri: Phyllanthus niruri; ACE: Angiotensin-converting enzyme; HHL: Hippuryl-L-histidyl-L-leucine; HA: Hippuric acid; PDB: Protein database; IC50: 50% inhibition concentration; FH: N-hexane fraction; FE: Ethyl acetate fraction; TLC: Thin layer chromatography; UV-VIS: Ultraviolet-visible; NMR: nuclear magnetic resonance; FTIR: Fourier–Transform infrared; MS: Mass spectrometry; HMQC: Heteronuclear Multiple-Quantum Correlation; HMBC: Heteronuclear multiple bond correlation; TADOK: Tugas Akhir Mahasiswa Doktor. After docking to an ACE complex macromolecule, quercetin 3-O-β-D-glucopyranosyl-(1'''-6'')-α-rhamnoside obtained more interactions than lisinopril. Hypertension is one of the most common diseases worldwide and causes about 12% of deaths each year. It is a risk factor for heart disease, mainly myocardial infarction, atherosclerosis (i.e., hardening of the arteries), heart failure, and stroke. The angiotensin-converting enzyme (ACE) plays an essential role in hypertension management. It converts angiotensin I into angiotensin II in the kidneys (renin-angiotensin-aldosterone system) and activates bradykinin. Skeggs et al. first explained ACE's mechanism of action in 1953–1956., Some kinds of synthetic ACE inhibitors, such as captopril, lisinopril, ramipril, enalapril, fosinopril, and zofenopril, have been widely used for the treatment of hypertension. However, studies of ACE inhibitor active compounds from natural products (mainly plant resources) continue because they have potential secondary metabolite content and fewer side effects.,, In vitro ACE inhibitory activity assay is a valid assay method for discovering drugs from active compounds found in natural products. Some studies have reported medicinal plants that exhibit potential antihypertensive effects.,,,,, Therefore, advanced research into finding other sources of natural products is needed. Various plants have been conventionally used to control blood pressure or hypertension. One of them is Phyllanthus niruri from the Euphorbiaceae family, known locally in Indonesia as “Meniran.” This plant can be found in tropical and subtropical climates including Indonesia and has a long history of ethnomedicinal or traditional use worldwide. Some studies have reported that aerial part of this plant has various pharmacological properties as follows: hepatoprotective, antiplasmodial, antihyperalgesic, antioxidant, anti-inflammatory,, anti-gastric ulcer, immunostimulator, diuretic, prostate cancer treatment, and hair growth stimulant. Scientific information related to the phytochemical constituents of this plant was described in detail by Kaur et al. in 2017; it contains alkaloids, polyphenols, tannins, flavonoids, lignans, terpenoids, anthocyanins, saponins, and coumarins. Methanol, n-hexane, and aqueous extracts of P. niruri were reported to have the inhibitory activity on ACE. However, an active compound from this plant that can be used as an ACE inhibitor has not been reported. In this study, four active compounds which could potentially act as ACE inhibitors were isolated and identified from P. niruri, and a molecular docking study was performed to predict the mechanism of action and interactions between the ligands (i.e., active compounds) and a macromolecule. The aerial parts of P. niruri were purchased in Banten Province, Indonesia and were authenticated by the Indonesia Institute of Sciences, Research Center of Biology, Cibinong–Bogor, West Java, Indonesia. The voucher specimen was deposited at the Laboratory of Pharmacognosy–Phytochemistry, Faculty of Pharmacy, Universitas Indonesia, Depok, West Java, Indonesia. Some chemicals used in this study, including n-hexane, ethyl acetate, chloroform, n-butanol, and acetone, were purchased from PT SmartLab Indonesia, Indonesia. ACE and hippuryl-L-histidyl-L-leucine (HHL) substrates were purchased from Sigma Aldrich, USA. Captopril was acquired from PT Kimia Farma, Indonesia. Hydrochloric acid, sodium carbonate, potassium dihydrogen phosphate, sodium hydroxide, silica gel 60 H, silica gel thin-layer chromatography (TLC) plate GF254, and preparative TLC plates were purchased from Merck, Germany. Sephadex LH-20 was obtained from Amersham Bioscience, Sweden. Apparatuses used in the study include a rotary vacuum evaporator (Buchi, Germany), micropipettes 100-1000 μl (Eppendorf, Germany), a ultra violet visible (UV-VIS) spectrophotometer (Shimadzu, Japan), a UPLC-Qtof-HR-mass spectrometry (MS) XEVotm mass spectrometer (Water, Milford, MA, USA), a Fourier–transform infrared (FT-IR) (Waltham, MA, USA), an 1H-nuclear magnetic resonance (NMR) and 13C-NMR (JEOL JNM, Japan), a microplate reader (BioTek Elx 808, USA), and multichannel pipettes (Thermo Scientific). The powdered herb was macerated with 80% methanol and filtered. The same procedure was repeated three times. The organic layer was combined and concentrated using a rotary vacuum evaporator and then dried to give 476 g of methanolic extract. The extract (450 g) was dispersed in warm water and n-hexane was added. The n-hexane layer was collected and dried using a rotary vacuum evaporator to obtain the n-hexane fraction (FH). Partitioning was continued by adding ethyl acetate and then n-butanol. The organic layers were evaporated to give ethyl acetate and n-butanol fractions. The n-hexane (19.28 g) and ethyl acetate (5 g) fractions were subjected to column chromatography using silica gel 60 as a stationary phase. FH and ethyl acetate fraction (FE) were eluted with n-hexane: Ethyl acetate with a polarity gradient from 100% to 10%, followed by ethyl acetate: Methanol with a gradient from 100% to 10%. Eighty-one 100 ml fractions were collected. The FE was subjected to silica gel column chromatography and eluted with n-hexane: Ethyl acetate eluent (5:5), and 24 fractions were collected every 100 ml for each fraction. The n-butanol fraction was subjected to column chromatography with Sephadex LH-20. The sample was eluted with methanol: Water with several comparison gradients from 50% to 100%. Two hundred and twenty fractions of 20 ml for each fraction were collected. Elution and fractionation were controlled by TLC under UV light at 254 nm and 366 nm. Similar fractions were combined according to their purities to give 15 for an (FHA–FHO), 5 for ethyl acetate (FEA–FEE) fraction, and 6 for an n-butanol fraction (FBA–FBF). Compound 1, Compound 2, Compound 3, and Compound 4 were obtained from FHE, FHG, FEC, and FBC, respectively, after recrystallization. The structure of the isolated compounds was determined by analyzing spectroscopic data from UV-VIS, FT-IR, MS, 1H-NMR, 13C-NMR, and NMR-two-dimensional (2D) that covered Heteronuclear Multiple-Quantum Correlation (HMQC) and Heteronuclear Multiple-Bond Correlation (HMBC) spectra. The inhibitory effect was analyzed in vitro via spectrophotometry, which measured the formed hippuric acid (HA). HHL was catalyzed with ACE to form HA and L-histidyl-L-leucine. The sample's ACE inhibitory activity was determined according to Kurniawan et al. which was based on the strategy developed by Cushman and Cheung., Briefly, 50 μl of the sample solution was added to 50 μl of 5 mM HHL as the substrate, it was vortexed for a few seconds to achieve homogenization, 100 μl ACE solution (0.025 U/ml) was added, and then it was incubated at 37°C for 90 min. The reaction was stopped by the addition of 250 μl 1N HCl. Formed HA was extracted with 1.5 ml ethyl acetate followed by centrifugation for 10 min and evaporated. HA was dissolved in 3 ml of ionized water, and the absorbance was measured at 228 nm. In silico molecular docking studies were conducted using a computer with core i7 processor, and AutoDockZn was applied based on the previous study. The crystal structure of the human ACE in complex with native ligand lisinopril (protein database (PDB) id: 1O86) was downloaded from http://www.rcsb.org/pdb/explore.do? structureId = 1O86. Ligands were created manually in a 2D format in Marvin Sketch. AutoDockZn was employed for calculations in the molecular docking studies using a Lamarckian genetic algorithm between the flexible ligand and rigid receptor, a population size of 300, a maximum of 2,50,000 generations, and 2,500,000 evaluations for 100 GA runs. The root means square deviation was tolerated to below 2.0 Å for the clustering of docking results. The ligands' 2D structure was visualized by LigandScout. Ligand-residue interactions were observed by LigPlot software. One cardiovascular risk for diabetic patients is hypertension. In this study, ACE inhibition as a hypertension mechanism was analyzed by measuring the absorbance of HA as the product of the reaction between HHL and ACE that was not inhibited by the sample. The positive result of ACE inhibition analysis is consistent with a previous study which found that a methanol extract of P. niruri inhibits the activity of ACE. Each fraction was isolated using column chromatography; analyzing its inhibitory effect on ACE resulted in four compounds [Table 1]. Specific results regarding each compound are as follows: 203.1 mg of Compound 1 and 78.5 mg of Compound 2 contained hexane fractions while 182.1 mg of Compound 3 was from the ethyl acetate fraction, and 10.9 mg of Compound 4 was from n-butanol. Compound 1: The FTIR spectrum of Compound 1 (crystal-like white needle) showed asymmetric = C-H-(2901.04 cm−1), C-O ester (1259.56, 1026.16 cm−1), and a H-C = C-H aromatic ring bond (3055.3, 1639.5, 1506.4, 1425.4 cm−1). The molecular weight [M+] = 430.2 and molecular formula C24H30O7 were obtained using GC-MS. Next, 1H-NMR and 13C-NMR were performed using CD3 OD, and the proton signals were obtained at 3.3 ppm (6H, s), 3.84, 3.86 (6H, s), and 3.80 ppm (3H, s). Compound 2: The FTIR spectrum of Compound 2 (crystal-like white needle) had a similarity to Compound 1 because it also showed the asymmetric = C-H-(2868.24 cm−1), C-O ester (1236.41, 1141.9, 1167.18, 1026.16 cm−1), and H-C = C-H aromatic ring bond (1587.47, 1508.38 cm−1). Via the GC-MS study, the molecular weight (M+) 418 and the molecular formulation C24H34O6 was obtained. 1H-NMR and 13C NMR analyses were performed using CDCl3, and the proton signals were received at 6.74 ppm (2H, d), 6.64 ppm (2H, dd), 6.61 ppm (2H, d), 3.85 ppm (6H, s), 3.8 ppm (6H, s), 3.2–3.3 ppm (10H, m), 2.6–2.7 ppm (4H, m), and 2.03 ppm (2H, m). Compound 3: (solid creamy-colored amorphous) showed O-H (3365.9 cm−1), C = O (1693.59), aromatic C = C (1616.4 cm−1), and C-O bond (1263.42 cm−1) based on the FTIR study. The GC-MS data showed that the molecular weight (M+) was 184 with a molecular formula of C8H8O. 1H-NMR and 13C-NMR were subsequently performed using CD3 OD; the proton signals were obtained at 3.81 ppm (3H, s) and 7.04 (2H, s). Compound 4: (yellow crystal) showed O-H (3431.48, 3319.6 cm−1, broad), C = O (1694.98 cm−1), aromatic C = C (1597.11 cm−1, 1506.46 cm−1, 1548.23 cm−1), and C-O bond (1203.62, 1062.81, 1012.66 cm−1) from the FTIR study. The LC-MS data showed that the molecular weight (M + Na) was 633 with a molecular formula of C27H30O16. Then the 1H-NMR and 13C-NMR analyses were performed, and the proton signals were obtained at 7.67 ppm (1H, d), 7.64 ppm (1H, dd), 6.8 ppm (1H, d), 6.4 ppm (1H, d), 6.21 ppm (1H, d), 5.10 ppm (1H, d), 4.5 ppm (1H, d), 3.4 ppm (1H, m), 1.12 ppm (3H, d), and 3.27–3.80 ppm (glucose proton). This study found four potential compounds to be developed as antihypertension. [Table 2] shows a comparison of all compounds with literature compound based on previous studies.,, Compound 1 was identified as hypophyllanthin with (C24H30O7) [Table 2]a, Compound 2 was identified as phyllanthin (C24H34O6) [Table 2]b, Compound 3 was identified as methyl gallate (C8H8O5) [Table 2]c, and Compound 4 was identified as quercetin 3-O-β-D-glucopyranosyl-(1'''-6'')-α-rhamnoside [Table 2]d.
Value of ACE inhibitory activity (as % inhibition) from methanolic extract was 48.32%, FH of 43.54%, FE of 56.55%, and an n-butanol fraction of 76.99%, at each concentration of 125 μg/ml. Analysis of the inhibitory effect of ACE was performed to methyl gallate and quercetin 3-O-β-D-glucopyranosyl-(1'''-6'')-α-rhamnoside compared to captopril as the positive control [Table 3]. Hypophyllanthin and phyllanthin are marker compounds for P. niruri, and the inhibition effect of ACE enzymes for these two compounds was less potent than captopril as a control. Among these four compounds, methyl gallate and quercetin 3-O-β-D-glucopyranosyl-(1'''-6'')-α-rhamnoside were the most likely to inhibit the activity of ACE enzymes actively. [Table 4] demonstrates the interaction of the ACE complex with the ligand (native ligand, positive control, and isolated compounds), free energy binding, and inhibition constant (μM) from the molecular docking studies results using the AutoDockZn program. Glu384, Glu162, Lys511, Tyr520, Val518, Asp377, Ala354, Tyr523, Glu411, His513, His353, His383, and His387 are binding sites of ACE. Lisinopril as a native ligand performs hydrogen bonding with Glu384 and Glu162 and has a hydrophobic interaction with Val518. The C–terminal carboxylate of lisinopril interacts with positively charged ions toward Lys511 and Tyr520 [Figure 1]. [Figure 2]a shows the interaction of the ACE complex with native ligand lisinopril (PDB: 1O86) visualized by LigPlot software. Lisinopril performs hydrogen bonding with Glu384 and Glu162 and indicates a hydrophobic interaction with Val518. C–terminal carboxylate of lisinopril interacts with positively charged ions toward Lys511 and Tyr520. [Figure 2]b shows the interaction of captopril as a ligand or positive control with the ACE complex. This ligand gives free energy binding (−5.17 ΔG Kcal/mol) and performs hydrogen bonding with Glu384, has a hydrophobic interaction with Val518 and interacts with positively charged ions on Lys511 and Tyr520. The positive control acts like the native ligand. In [Figure 2]c, hypophyllanthin gives the lowest free energy binding while demonstrated fewer contacts with the potential binding site. This compound exhibits hydrogen bonding with Lys511 (NZ atom, 2.84 Å). Tyr520 is an essential binding site for C-terminal carboxylate by performing an ionic interaction. In this study, Tyr520 performed a hydrophobic interaction with Compound 1 was rather than an ionic interaction. Ala354, which is known for carrying out hydrogen bonding, showed a hydrophobic interaction instead. His383 and His387 might also be accompanied by Glu411, are residues that bind to Zinc, and have zinc-coordinating behavior. These residues performed hydrophobic interactions toward the ligand. Zinc forms a strong bonding with histidine and ligand. It is important to remember that zinc is material for the catalytic activity of ACE. Phyllanthin also binds to Lys511 through hydrogen bonding (NZ atom, 3.32 Å) as shown in [Figure 2]d. This ligand performed hydrophobic contact with His383, His387, His353, and Glu411. Histidine, accompanied by Glu411, appeared in this interaction of ligand-residues. These residues bind to zinc, and zinc binds to the ligand. Essential residues that bind to the ligand were very limited in hypophyllanthin and phyllanthin. [Figure 2]e demonstrates that methyl gallate has hypoglycemic activity by inhibiting the aldose reductase enzyme, thus reducing cardiovascular risk (e.g., hypertension) in diabetic patients. Compared to the two previous compounds, methyl gallate demonstrated more H-bonding with residues. One of the essential residues, His353, interacted with two oxygen atoms of methyl gallate (O atom, 3.00 Å, and O1 atom 2.93 Å). Glu384 was also involved in this hydrogen bonding interaction (OE2 atom, 2.74 Å). Ala354 displayed hydrophobic contact instead of binding to the nitrogen atom as shown on lisinopril. His383, His387, and Glu411 appeared once more in the visualization. In [Figure 2]f, quercetin 3-O-β-D-glucopyranosyl-(1'''-6'')-α-rhamnoside showed the most interactions compared to the other structures and scored the best affinity. The residue of protein receptor mainly Tyr520 and Glu162 bound with the O8 atom (3.17 Å), OE atom (2.34 Å), and the OE1 atom (2.93 Å). These bindings were also demonstrated by the native ligand (lisinopril). In this compound, zinc bound to His387, His383, Glu411, and the ligand. [Figure 2]g, unlike other compounds, the aglycone of quercetin (Compound 4) did not bind to zinc, although the histidine and Glu411 bound to Zn. Aglycone of Compound 4 created several interactions with essential residues of 1O86. Aglycone slightly had less interaction compared to quercetin 3-O-β-D-glucopyranosyl-(1'''-6'')-α-rhamnoside and placed as the second lowest free energy binding. It performed hydrogen bonding with Lys511 (NZ atom, 2.99 Å, and 2.78 Å), Tyr520 (OH atom, 2.98 Å) which also demonstrated in lisinopril interaction. Ala354, Glu162, and Tyr523 showed hydrophobic interaction rather than bound to electronegative atoms (oxygen or nitrogen) as shown on the native ligand. In silico molecular docking studies provides additional data on ACE inhibitors mainly by predicting interactions and binding sites. 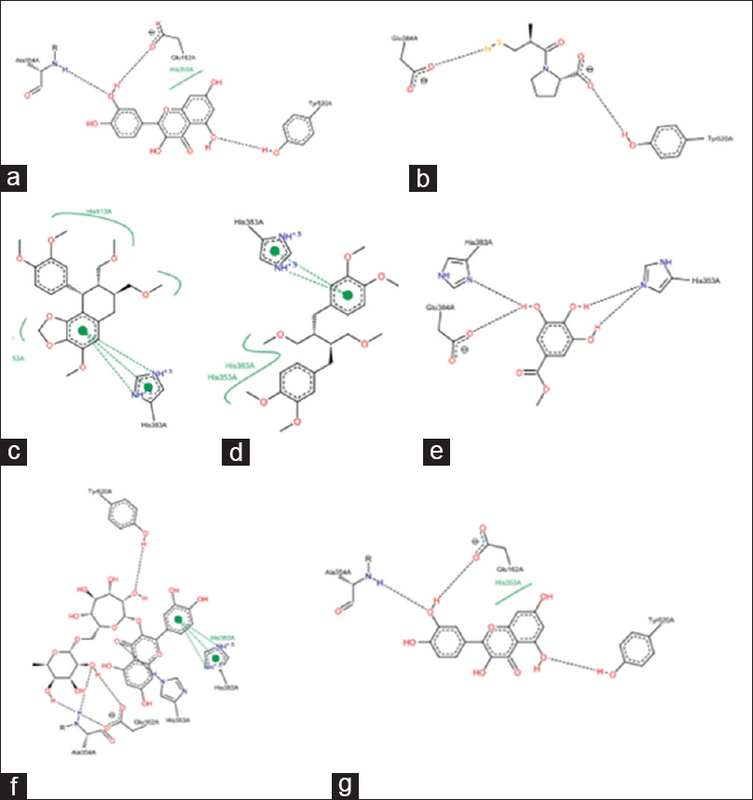 The in-silico method emphasizes ligand-residue interactions, thereby predicting the inhibitory activity of these compounds. Residues that played a vital role in this docking study were less involved than what we expected from the literature. After docking to an ACE complex macromolecule (PDB: 1O86), quercetin 3-O-β-D-glucopyranosyl- (1'''-6'')-α-rhamnoside demonstrated more interactions than lisinopril. ACE is a chloride-dependent zinc metalloendopeptidase. The abolition of zinc alters the activity toward chromophoric substrates furan acryloyl-Phe-Gly-Gly. ACE activity was lost below pH 7.5 without the presence of zinc. In the presence of zinc, ACE remains active at pH 6. Zinc plays a vital part as a catalytic component of ACE; it binds to His383, His387, Glu411, and oxygen atoms from the carboxylate group of Lisinopril. This study showed that Compound 3 (methyl gallate) and Compound 4 (quercetin 3-O-β-D-glucopyranosyl-(1'''-6'')-α-rhamnoside), are potential active compounds as ACE inhibitors from P. niruri herb. Furthermore, molecular docking studies predicted that there are similar action mechanism and domain specificity interaction between native ligand and this compound with the ACE complex macromolecule. The authors would like to thank Directorate of Research and Community Engagement, Universitas Indonesia via Hibah Tugas Akhir Mahasiswa Doktor 2018 for their financial support. This study was financially supported by Directorate of Research and Community Engagement, Universitas Indonesia via Hibah Tugas Akhir Mahasiswa Doktor 2018. Mendis S, Puska P, Norrving B. Global Atlas on Cardiovascular Disease Prevention and Control. Geneva: World Health Organization; 2011. Tabassum N, Ahmad F. Role of natural herbs in the treatment of hypertension. Pharmacogn Rev 2011;5:30-40. Atlas SA. The renin-angiotensin aldosterone system: Pathophysiological role and pharmacologic inhibition. J Manag Care Pharm 2007;13:9-20. Skeggs LT Jr., Kahn JR, Lentz K, Shumway NP. The preparation, purification, and amino acid sequence of a polypeptide renin substrate. J Exp Med 1957;106:439-53. Ahmad I, Yanuar A, Mulia K, Mun'im A. Review of angiotensin-converting enzyme inhibitory assay: Rapid method in drug discovery of herbal plants. Pharmacogn Rev 2017;11:1-7. Barbosa-Filho JM, Martins VK, Rabelo LA, Moura MD, Silva M, Cunha EV, et al. Natural products inhibitors of the angiotensin-converting enzyme (ACE). A review between 1980-2000. Rev Bras Farmacogn 2006;16:421-46. Castro Braga F, Wagner H, Lombardi JA, de Oliveira AB. Screening the Brazilian flora for antihypertensive plant species for in vitro angiotensin-I-converting enzyme inhibiting activity. Phytomedicine 2000;7:245-50. Cushman DW, Wang FL, Fung WC, Grover GJ, Harvey CM, Scalese RJ, et al. Comparisons in vitro, ex vivo, and in vivo of the actions of seven structurally diverse inhibitors of angiotensin converting enzyme (ACE). Br J Clin Pharmacol 1989;28 Suppl 2:115S-30S. 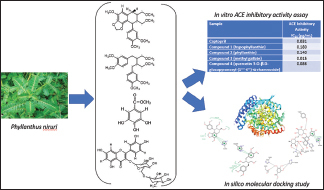 Simaratanamongkol A, Umehara K, Noguchi H, Panichayupakaranant P. Identification of a new angiotensin-converting enzyme (ACE) inhibitor from Thai edible plants. Food Chem 2014;165:92-7. Daskaya-Dikmen C, Yucetepe A, Karbancioglu-Guler F, Daskaya H, Ozcelik B. Angiotensin-I-converting enzyme (ACE)-inhibitory peptides from plants. Nutrients 2017;9. pii: E316. Lacaille-Dubois MA, Franck U, Wagner H. Search for potential angiotensin converting enzyme (ACE)-inhibitors from plants. Phytomedicine 2001;8:47-52. Ranilla LG, Kwon YI, Apostolidis E, Shetty K. Phenolic compounds, antioxidant activity and in vitro inhibitory potential against key enzymes relevant for hyperglycemia and hypertension of commonly used medicinal plants, herbs and spices in Latin America. Bioresour Technol 2010;101:4676-89. Amin ZA, Alshawsh MA, Kassim M, Ali HM, Abdulla MA. Gene expression profiling reveals underlying molecular mechanism of hepatoprotective effect of Phyllanthus niruri on thioacetamide-induced hepatotoxicity in sprague dawley rats. BMC Complement Altern Med 2013;13:160. Ifeoma O, Samuel O, Itohan AM, Adeola SO. Isolation, fractionation and evaluation of the antiplasmodial properties of Phyllanthus niruri resident in its chloroform fraction. Asian Pac J Trop Med 2013;6:169-75. Moreira J, Klein-Júnior LC, Cechinel Filho V, de Campos Buzzi F. Anti-hyperalgesic activity of corilagin, a tannin isolated from Phyllanthus niruri L. (Euphorbiaceae). 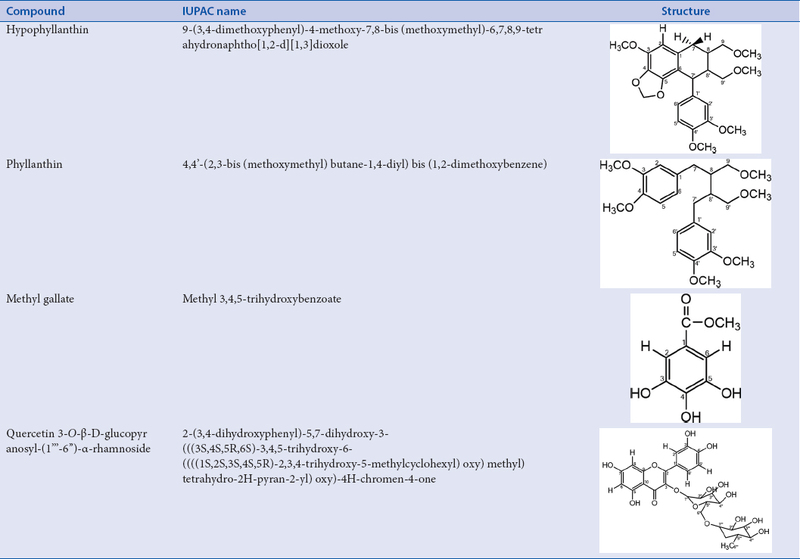 J Ethnopharmacol 2013;146:318-23. Fang SH, Rao YK, Tzeng YM. Anti-oxidant and inflammatory mediator's growth inhibitory effects of compounds isolated from Phyllanthus urinaria. J Ethnopharmacol 2008;116:333-40. Mostofa R, Ahmed S, Begum MM, Sohanur Rahman M, Begum T, Ahmed SU, et al. Evaluation of anti-inflammatory and gastric anti-ulcer activity of Phyllanthus niruri L. (Euphorbiaceae) leaves in experimental rats. BMC Complement Altern Med 2017;17:267. Muthulakshmi M, Subramani PA, Michael RD. Immunostimulatory effect of the aqueous leaf extract of Phyllanthus niruri on the specific and nonspecific immune responses of Oreochromis mossambicus peters. Iran J Vet Res 2016;17:200-2. Udupa A, Sanjeeva S, Benegal A, Prusty V, Kodancha G, Kumar M, et al. Diuretic activity of Phyllanthus niruri (Linn.) in rats. Health 2010;2:511-2. Unni R, Shah G, Snima KS, Kamath CR, Nair S, Lakshmanan VK. Enhanced delivery of Phyllanthus niruri nanoparticles for prostate cancer therapy. J Bionanoscience 2014;8:101-7. Patel S, Sharma V, Chauhan NS, Thakur M, Dixit VK. Evaluation of hair growth promoting activity of Phyllanthus niruri. Avicenna J Phytomed 2015;5:512-9. Kaur N, Kaur B, Sirhindi G. Phytochemistry and pharmacology of Phyllanthus niruri L.: A review. Phytother Res 2017;31:980-1004. Ueno H, Horie S, Nishi Y, Shogawa H, Kawasaki M, Suzuki S, et al. Chemical and pharmaceutical studies on medicinal plants in Paraguay. Geraniin, an angiotensin-converting enzyme inhibitor from “paraparai mi,” Phyllanthus niruri. J Nat Prod 1988;51:357-9. Kurniawan A, Saputri FC, Ahmad I, Mun'im A. Isolation of angiotensin-converting enzyme (ACE) inhibitory activity quercetin from Peperomia pellucida. Int J Pharm Tech Res 2016;9:115-21. Cushman DW, Cheung HS. Spectrophotometric assay and properties of the angiotensin-converting enzyme of rabbit lung. Biochem Pharmacol 1971;20:1637-48. Santos-Martins D, Forli S, Ramos MJ, Olson AJ. AutoDock4(Zn): An improved autoDock force field for small-molecule docking to zinc metalloproteins. J Chem Inf Model 2014;54:2371-9. Maciel M, Cunha A, Dantas T, Kaiser C. NMR characterization of bioactive lignans from Phyllanthus amarus Schum &. Ann Magn Reson 2007;6:76-82. Natesh R, Schwager SL, Sturrock ED, Acharya KR. 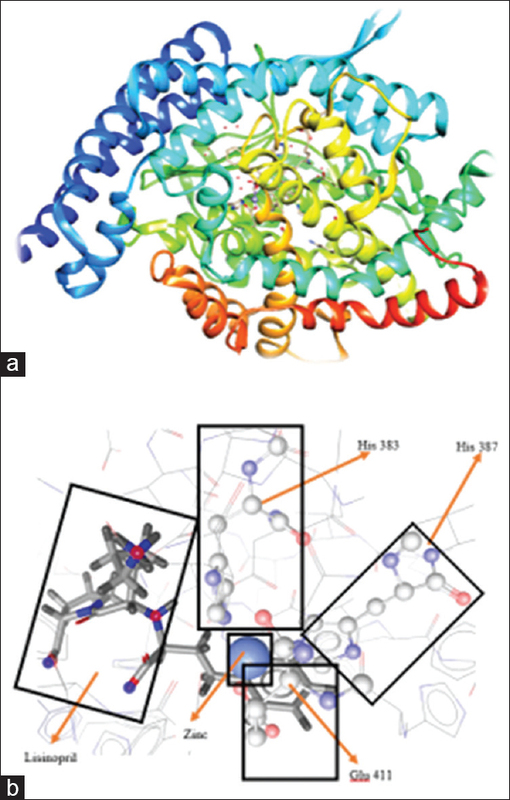 Crystal structure of the human angiotensin-converting enzyme-lisinopril complex. Nature 2003;421:551-4. Bünning P, Riordan JF. The functional role of zinc in angiotensin converting enzyme: Implications for the enzyme mechanism. J Inorg Biochem 1985;24:183-98. Bünning P, Riordan JF. The role of zinc in angiotensin-converting enzyme. Isr J Chem 1981;21:43-7. Bünning P, Holmquist B, Riordan JF. Substrate specificity and kinetic characteristics of angiotensin converting enzyme. Biochemistry 1983;22:103-10.